Fixmart are supporting Ductwork and Mechanical contractors with technical advice, site visits, pull out tests and meeting strict delivery slots on this prestigious project. Featuring two complementary yet individual office buildings, as well as beautifully landscaped gardens designed around the historic Roman ruins of London Wall and the thirteenth century St. Alphage Church, London Wall Place is an exciting development providing over an acre of public space in the City of London. Currently under construction with completion scheduled for 2017, Fixmart are pleased to be supporting the Mechanical and Ductwork contractors on this prestigious project. 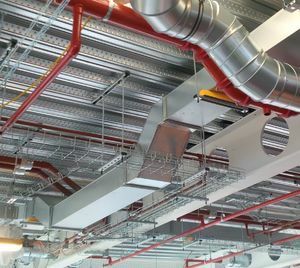 Fixmart are supplying the Ductwork and Mechanical contractors with Ductwork and Pipework Supports, Bracketry and Fixings. At the time of writing works are being carried out in the Shell / Core and Basement levels, while the Cat A and Fit-out contracts have yet to be awarded. Fixmart have supported the contractors on site by carrying out pull-tests on both Anchors in the basement and Wedge Nuts for the Decking on all upper levels. This is a free service arranged through our suppliers where a Test Rig is attached to the Anchor or Wedge Nut and is pulled to the designated stress load level, to test the strength of the fixing. A detailed report is then provided for the contractors to show the conformance of the fixings to the project required load levels. Our project support team have also made regular visits to site to advise on technical enquiries and to ensure Fixmart are delivering on their promises, such as meeting strict time slots for deliveries so materials are available on site when needed. Once completed London Wall Place will offer yet another distinctive landmark in the heart of the city. 1 London Wall Place will provide 310,000 square feet of premium, flexible space across 12 stories, including accessible outdoor terraces with striking views towards St. Paul’s Cathedral. 2 London Wall Place will be a 16-story building providing 190,000 square feet of consistent, highly efficient 12,000-square-foot floor plates, all of which also offer spectacular views across the City.